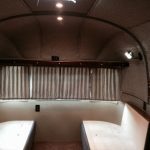 The beautiful soft fabric is installed over the soundproof insulation. Window are now put back in. Blinds are installed. Note the license plate. I had found this plate in my travels. 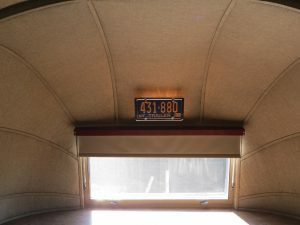 My Airstream was originally purchased in New York State in 1969. 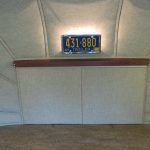 I asked Craig to figure out a place of honour for this 1969 NY trailer plate. He did – it hangs over my recording area – beautifully back lit.